I'm normally a pants-type of girl. I will wear those denims as long as the weather allows it. During warm weather it's a pain finding stuff to wear. Especially as I'm of the larger size variety. Last weekend I had a reason to wear a dress though and I bought those leggings with lace at the hem everyone seems to wear here these days. It got me thinking that maybe I could pull a skirt off after all. I knew I found a cheat sheet for skirt making on Pinterest a while back - over a year it seems - and it looked easy enough. 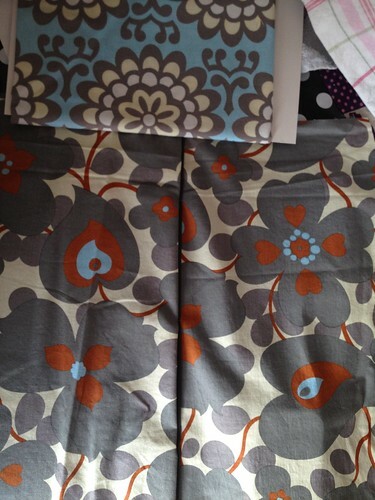 I had a large piece of Amy Butler fabric languishing in my stash that I bought several years ago and intended to sew a dress from. 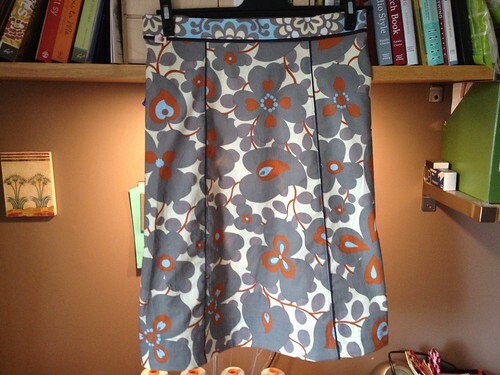 There was more than enough of it and a good chunk of a coordinating fabric for a hem facing and a waistband. I also had a piece of dark grey blue solid to add as flat piping between the front and back centre panels. I studied the cheat sheet and took some measurements. I needed a waist measurement and a hip/derrière measurement. 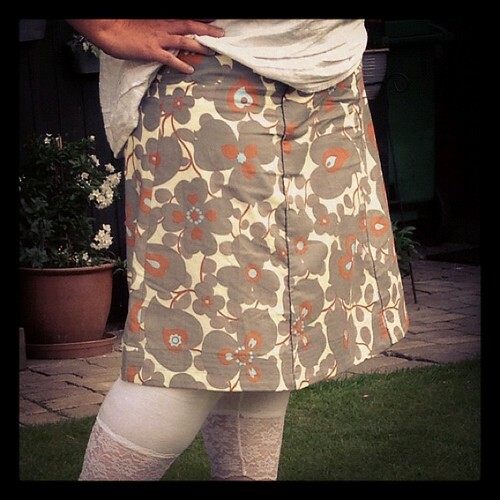 I also needed to know how long I wanted the skirt to be and the distance from my waist to the widest part of of my hip. I chose a six panel configuration for it just like on the cheat sheet, but you could easily divide into 4 or 8 panels instead. I cut the back panel in two and remembered to add seam allowance for an invisible zip. For the waistband I bought some 3.5" wide waist tape that I ironed to the outer fabric. It adds some body to the waistband and it makes sewing it really easy as there are grooves in it that help you fold it evenly. I also added the same piping to the underside of the waistband. 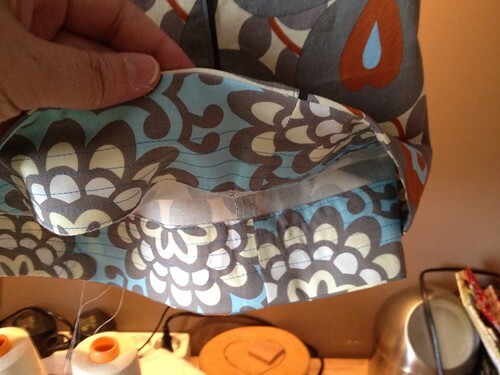 Since the panels are in an a-line shape I felt it would be easier to hem using a hem facing rather than a folded hem. I have made enough Oliver + S-dresses for my girls to feel at home with that technique. Instead of a slip stitch to attach the facing I opted on five rows of top stitching. It adds some weight to the hem and keeps it in place. I wore the skirt last night when we were visiting my uncle. It was the first time in a long while that I felt comfortable in a skirt.